There is a significant complexity of movements and an ability to adapt to changing situations during a match, hence, a factor which decides about sports rank of a player is their motor fitness. The assessment of muscle power output and abilities of coordination in high-rank players can be one of the most essential model indicators either in the process of athlete selection or in the process of sports training. The research question is: How the measured indicators of a somatic body construction and motor fitness condition the sports level of volleyball players who specialize in different tactical functions? The paper demonstrates the test results of 12 volleyball players from MKS Muszynianka – a vice-champion of Poland in 2009. Basic features of a somatic body construction were measured; the indicators of muscle dynamic strength, visual perception and visual-motor coordination were tested. The comparative analysis of the applied somatic and fitness indicators in the study explains both the model of choice of tactical specializations in the game and sports hierarchy of volleyball players at championship level. Lengthwise predispositions of a body construction are prominent in the model; however, fitness skills (muscle dynamic strength and visual-motor coordination) may well compensate for insufficient somatic indicators. 1. Allard F., Starkes J.L. Perception in sport: volleyball. Journal of Sport Psychology. 1980; 2: 22–33. 2. Bredeweg S. The elite volleyball athlete. In: Handbook of sports medicine and science. Volleyball. Eds. Reeser J.C., Bahr R. Blackwell Science 2003: 183–191. 3. Eider J. Sports mastery model features of volleyball teams participating in the European Volleyball Championship 2003. Zeszyty Naukowe Uniwersytetu Szczecińskiego nr 404, Prace Instytutu Kultury Fizycznej nr 21. 2004: 149–157. 4. Eurofit. Eurofit Tests of Physical Fitness, 2nd Edition. Strasbourg 1993. 5. Harman E.A., Rosenstein M.T., Frykman P.N., Rosenstein R.M., Kraemer W.J. Estimation of human power output from vertical jump. Journal of Applied Sport Science Research. 1991; 5 (3):116–120. 6. Kielak D. Zmiany cech somatycznych i skoczności siatkarzy, uczestników I.O. 1988–2000. Sport Wyczynowy. 2002; 7–8: 41–49. 7. Klocek T., Żak S. Strukturalne i motoryczne determinanty skuteczności gryw piłce siatkowej kobiet. Antropomotoryka . 2001; 22: 65–80. 8. Klocek T., Spieszny M., Szczepanik M. Komputerowe testy zdolności koordynacyjnych. COS. Warszawa 2002. 10. Kluka D.A. Visual perception and decision making in volleyball. In: Handbook of sports medicine and science. Volleyball. Eds. Reeser J.C., Bahr R. Blackwell Science. 2003: 203–210. 11. Marques M.C. van den Tillaar R. Gabbett T.J., Reis V.M., González-Badillo J.J. Physical fitness qualities of professional volleyball players: Determination of positional differences. Journal of Strength & Conditioning Research. 2009; 23 (4): 1106–1111. 12. Nejić D, Trajković N, Stanković R, Milanović Z, Sporiš G. A comparison of the jumping performance of female junior volleyball players in terms of their playing positions. Facta Universitatis: Series Physical Education & Sport. 2013; 11 (2): 157–164. 13. Palao J.M., Manzanares P., Valadés D. Anthropometric, Physical, and Age Differences by the Player Position and the Performance Level in Volleyball. Journal Of Human Kinetics. 2014; 44: 223–236. 15. Sibley B., Jennifer L., Etnier B. Time Course of Attention and Decision Making During a Volleyball Set. 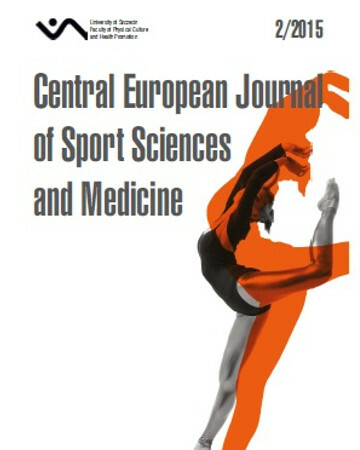 Research Quarterly For Exercise & Sport. 2004; 75 (1): 102–106. 16. Spieszny M. Starowicz M., Kazimierska U. Short running test as an indicator of sport games players’ motor fitness. Zeszyty Naukowe Uniwersytetu Szczecińskiego nr 771, Prace Instytutu Kultury Fizycznej nr 28. 2012: 49–58. 17. Vandewalle H., Pérès G., Heller J., Panel J., Monod H. Force-velocity relationship and maximal power on a cycle ergometer. Correlation with the height of a vertical jump. European Journal of Applied Physiology. 1987; 56 (6): 650–656. 18. Van Heest J.L. Energy demands in the sport of volleyball. In: Handbook of sports medicine and science. Volleyball. Eds. Reeser J.C., Bahr R. Blackwell Science. 2003: 11–17. 20. Zhang J. A study of correlation between extremities reaction time and performance of young Chinese women volleyball players. Sports Science/Tiyu Kexue. 1990; 10 (2): 70–76. 22. Żak S., Klocek T. Model mistrza w piłce siatkowej kobiet. Próba weryfikacji. Monografia nr 119. Wydawnictwo Politechniki Radomskiej 2008.